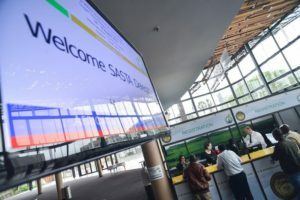 The annual SASTA Congress is one of the premier events in the South African Sugar Industry’s calendar and acknowledged as one of the leading Sugar Technologists’ events worldwide. The 2016 Congress took place the ICC in Durban. Even though the event delegates are predominantly South African, delegates attended from 19 other countries including as far afield as Australia and Vietnam. The Scientific Programme included plenary sessions and breakaway sessions which focused on either Factory or Agriculture. Some of the highlights of the event were the talk by the guest speaker, Dr. Adriana Marais, a mars one candidate during the opening session and a drought workshop on the afternoon of day one of the congress. The trade exhibition was sold out weeks before the congress and consisted of 60 exhibition stands. The exhibition area was the meeting place for all delegates during the Welcome reception, tea breaks, and lunches and proved to be a great networking opportunity. Turners Conferences look forward to working with the SASTA local organising committee again in 2017.